The Rachel Carson House (11701 Berwick Road, in Silver Spring, Maryland) is where Ms. Carson resided from 1957 until 1964. It is where she wrote her milestone book, Silent Spring. 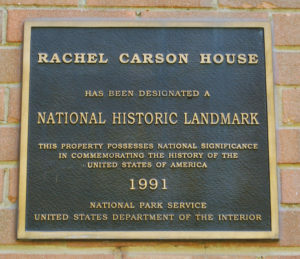 The Secretary of the U.S. Department of the Interior, in recognition of the influence of Silent Spring on significant events of the 20th Century declared the Carson House to be a National Historic Landmark in 1991. As the birthplace of Silent Spring the Rachel Carson House is linked to an exceptional period of U.S. history and to an exceptional woman. 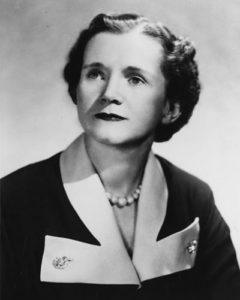 Rachel Carson (1907-1964), a world-famous scientist/author who popularized ecology through her books, articles and speeches had a positive impact on science, pesticide regulation, education, literature, public policy, organic practices, the empowerment of women and current attitudes toward Nature. Published in 1962, Silent Spring contributed in a major way to increasing the public’s knowledge and concern about environmental issues. It is credited with being responsible for the founding of the US Environmental Protection Agency in 1970, as well as contributing to the passing of important environmental legislation during the 1960s and 70s. (See Endnote: Silent Spring’s Enduring Impact on the USA). The Carson House can make visitors aware of a proud period in US history when legislation was passed with bi-partisan consensus to help preserve our natural resources and to protect the health of our citizens and our wildlife from poisonous chemical pesticides. It also serves to remind us all of Rachel Carson’s courageous attempt to correct misinformation about pesticides coming from the powerful chemical industry, while enduring the derogatory slurs about her capabilities as a woman and scientist emanating from the male dominated culture of the day. Lastly, it serves as a tribute to her lonely, courageous fight to succeed despite a major personal health problem, breast cancer to which she succumbed less than two years after Silent Spring’s publication. The Carson House can encourage those who today face similar challenges, with the inspiration of Rachel’s personal strength and her landmark achievement. 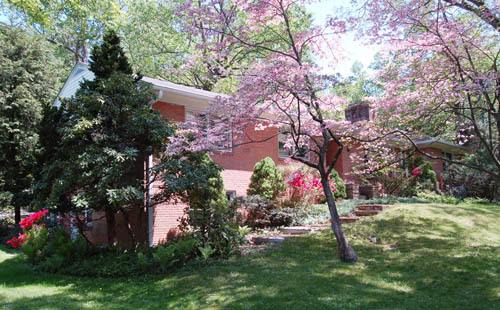 Rachel Carson resided in Silver Spring, Maryland for nearly all of her professional life, during most of that time in rented homes. In 1956, since no available houses met her requirements, she decided to build and for the first time became a Maryland property owner. Carson was a highly trained scientist with a master’s degree from the prestigious Johns Hopkins University in Baltimore, with graduate work at the Marine Biology Lab in Woods Hole, MA. Rachel had intended to pursue a Ph.D. degree but upon the death of her father, she had to abandon that plan in order to support her family. When Rachel Carson moved into her new home on Berwick Road in 1957, her household included her mother (who died in December, 1958), her newly adopted grandnephew, Roger, then 5 years old, along with cats, Jeffie and Moppet. Carson had been making a living as a full time author since 1952, after resigning from the US Fish andWildlife Service where she had enjoyed a successful career as a science writer and ultimately as editor-in-chief of publications. She had written numerous magazine and newspaper articles popularizing scientific findings on birds, fish, and other nature related subjects. By 1957 she had authored three best-selling books about the sea and marine life. Carson was renowned for her elegant, readable prose style by a public that sought science-based information and appreciated fine writing. Within a year after settling into her new home a series of events led Rachel to embark on a project focused on pesticide hazards. 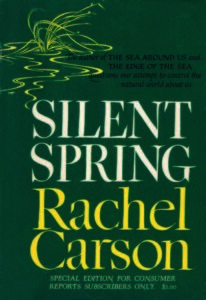 The scope of the problem, greater than she anticipated, would result in Rachel devoting much of the next four years to what became Silent Spring, the book for which she is most well-known today. Starting in June 16, 1962, 3 condensed excerpts from Silent Spring appeared in The New Yorker magazine following that Silent Spring was published as a complete book on September 27, 1962. Soon thereafter the highly respected CBS Reports’ news anchor, Eric Sevareid videotaped an interview with Rachel in the study of her Berwick Road home. 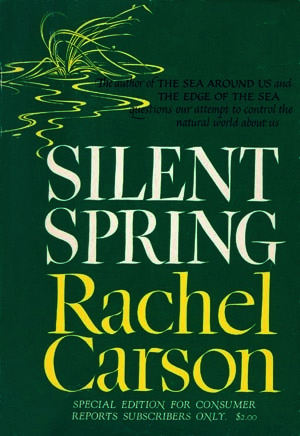 The resulting hour long show, “The Silent Spring of Rachel Carson” was broadcast to a nationwide audience in 1963 (and later rebroadcast in 1972).To examine the findings of Silent Spring, President John F. Kennedy convened the President’s Science Advisory Committee.The Committee’s report supported Silent Spring’s message and went even further with its famous “Recommendation 5,” that stated: “Elimination of the use of persistent toxic pesticides should be the goal.” These developments began the transformation of Rachel Carson into the source of a major new environmental awakening and enhanced the significance of her Berwick Road home. A number of awards and requests to speak followed.Where her health permitted, she accepted those speaking engagements that gave her the opportunity to say what she felt was important, she attended the most significant award presentations and testified before a Senate committee. Rachel wrote to her friend that the landscaping for her property “will probably be considered unconventional.” She intended the grounds to be a naturalistic garden with “few if any formal beds or borders… [and] a whole corner left as a wild tangle, wet underfoot for birds and frogs.” (4/9/57 letter to Dorothy, from Always, Rachel, ed.M. Freeman). 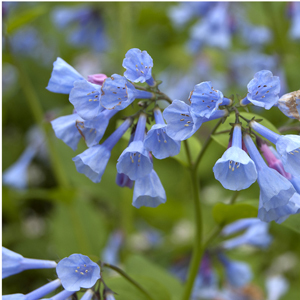 Among Rachel’s plantings were: daffodils, wood hyacinth (Scilla nonscripta), freesias, tulips, crocuses, Virginia bluebells (Mertensia), bleeding heart, azaleas and flowering quince. Rachel’s letters to Dorothy frequently mentioned some special natural event at her Maryland home that delighted and interested her including the Barred owl calling, the Mockingbird pouring out his heart to the whole world, the neighborhood frog chorus in spring, the red haze of her maple trees, her spicebushes, the Virginia bluebells coming up, and the vista of an ever-changing sky. 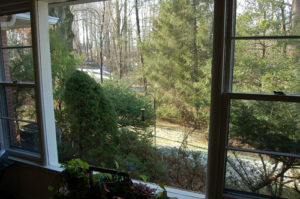 At this optimum work space, located in a peaceful and supportive property that provided sanctuary for the birds and other wildlife that she loved, Rachel found time to research and write Silent Spring while raising her newly adopted son (and grandnephew), Roger. Her tasks were made somewhat easier by her devoted housekeeper, Ida Sprow and through the able assistance of her researcher, Jeanne Davis who contributed to preparing Silent Spring. The surroundings and grounds continue to reflect much of the natural setting and unconventional approach to landscaping that sustained and comforted Rachel. 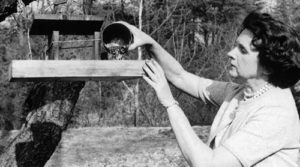 Many of the bird species that she wrote about to Dorothy during those years have been observed during the past decade by the current owners and visitors to the house. In keeping with Rachel’s practice, no chemical pesticides are used on the grounds. A pollinator garden has been created at the side of the property next to Berwick Road. The wood paneling along with the natural stone fireplaces in both the study and her living room are just as she left them in 1964, intended to evoke the outdoors. The large windows provide not only light but also extended views of the grounds, including the wild area—that Carson wanted preserved “for birds and frogs”—that continues to occupy over a third of the property. A corner of Carson’s study where she worked at her desk has been recreated from period pieces. Her own books are on three shelves against the wall. 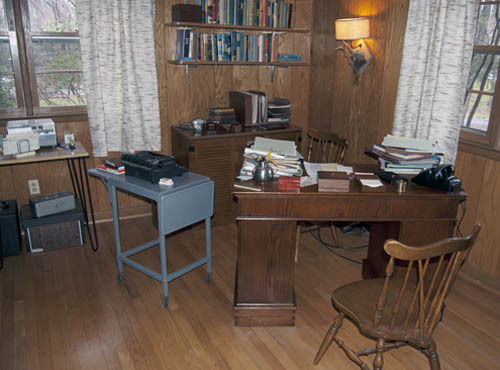 A document from 1959 is in the Royal typewriter beside her desk and the tape recorder is near at hand. It is as if she has just stepped away from her work to walk outdoors, take Roger to school or go shopping at nearby Four Corners. 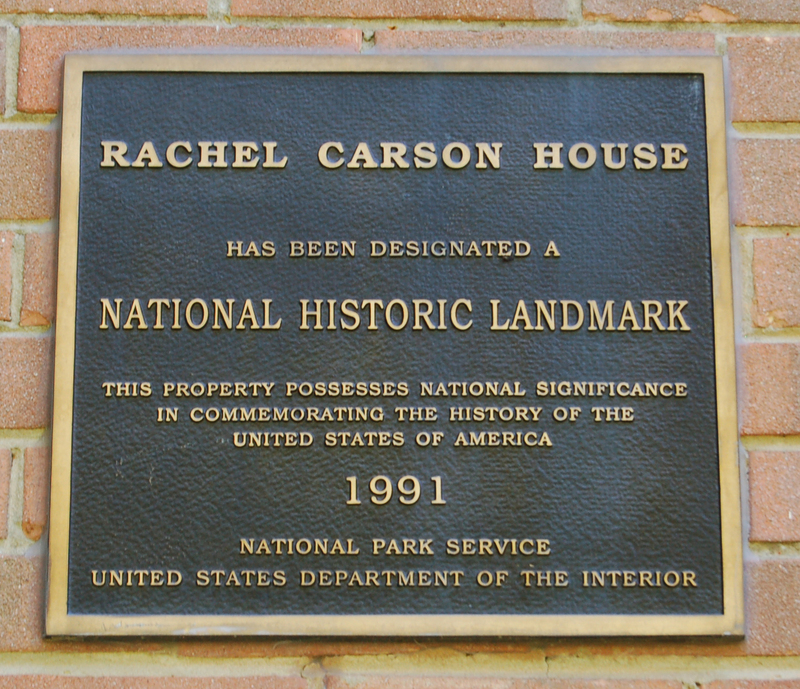 The Carson House is the site of the Rachel Carson Landmark Alliance headquarters office. This is a non-profit (501(c)(3) created to maintain the House and to carry Carson’s vision forward. Today more than ever we need to be mindful of Carson’s perspective that “True Science” reflects nature and provides the means of understanding and learning from it. WOMEN – The Carson House presents an opportunity to focus on Rachel’s remarkable achievement as a woman working in a man’s world and pioneering acceptance of the intellectual role of women in science, literature, policy making and problem solving. Rachel’s Woman of Conscience Award is on display at the House. (R. Carson, The Sense of Wonder, 1965). It is also important for those who care about children to give them the best possible environment in which to grow. This includes providing organic food when possible and helping them to avoid exposure to toxic pesticides and other dangerous chemicals. Rachel Carson feeding birds at her Berwick Road house. 1962. BIRDERS –You can learn of the species of birds observed by Carson at her house on Berwick Road as noted in her letters to Dorothy Freeman and reflect on the fact that several of them are no longer commonly found in this area.You can contemplate the accommodations for birds made on the property in 2018 – bird houses, brush piles, plants providing seeds and berries, and especially the beneficial insects available due to the avoidance of chemical pesticides on the grounds. You can appreciate that Carson, a cat lover did not allow her pets Moppet and Jeffie to roam free around the property but supervised their time outdoors. Thus not only were the cats protected from neighborhood dogs but also birds were safe from Rachel Carson’s cats. Silent Spring was a runaway best seller, flying off the bookstore shelves and immediately being translated into a number of foreign languages. It served as the fountainhead for modern environmental consciousness and important environmental legislation.